A few months ago, I was listening to an NPR podcast about CrossFit when a trainer who was being interviewed on the show said something that stopped me in my tracks. He said it’s important to differentiate between fitness and wellness, and to realize that the former doesn’t guarantee the latter. It struck a chord with me because in the past, I’ve been guilty of assuming that wellness will naturally come through fitness. Or, worse, of forsaking wellness for fitness. 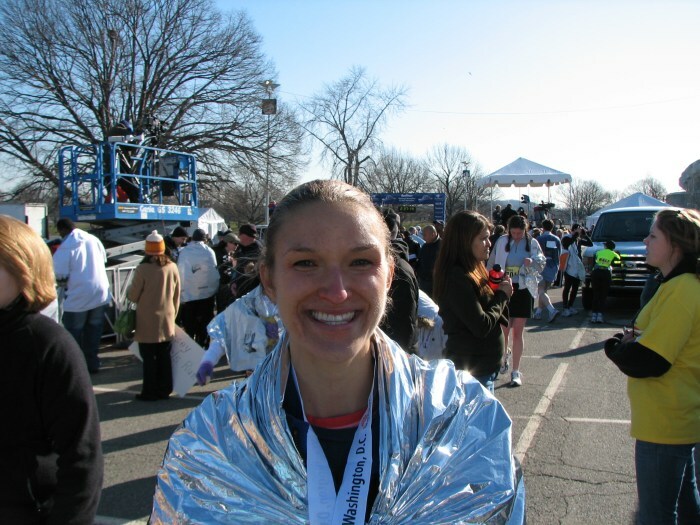 An example: In March 2009, I ran the National Half Marathon in Washington, D.C., in 1:49, a smoking-fast pace for me. I was as fit as I’ll ever be, thanks to months of intense training. But here’s the thing: I trained so hard, and was such an uncompromising perfectionist, I skipped a lot of stuff that would have contributed to my overall wellness, to include trips to wineries with friends, and even a ski trip to Tahoe. Focusing so single-mindedly on a time goal meant I achieved that goal at the expense of almost everything else. After finishing the National Half Marathon. Fast-forward four years, and my training schedule probably doesn’t look drastically different to an outsider. I’m still running and swimming and skiing and lifting. But my internal motivation is, happily, drastically different. Rather than set my sights on an external goal—a half-marathon time, a jeans size, etc.—I’m now living in accordance with my values and letting the external markers fall where they may. I meditate regularly. I am kinder to myself. Read more about how I’m working on wellness by heading over to Near and Far Montana, where you’ll find this as a guest post on my lovely writer-friend Jenn’s blog. Agreed! Fitness certainly helps get us into Wellness but it does not guarantee it by a long shot. Eating well, resting, living a balanced life – these things are all important too!